You are here: Home Topics Asylum policy Question and answer How are asylum applications by people from safe countries dealt with? The number of asylum applications by people from &apos;safe countries of origin&apos; is increasing, especially by people from the Western Balkan countries. Asylum seekers from safe countries have to be housed in reception centres, where places are scarce. Dealing with their applications also puts extra pressure on the asylum system and results in high costs. So these applications need to be dealt with as efficiently as possible. Since the beginning of 2016 the Netherlands has introduced the following measures. A large number of people from Western Balkan countries have taken advantage of the Dutch asylum system. The Netherlands has therefore taken measures. Six Western Balkan countries have been put on the Dutch list of safe countries of origin. Asylum applications by nationals of these countries will in principle be rejected. The six countries are: Albania, Serbia, the Former Yugoslavian Republic of Macedonia, Kosovo, Bosnia Herzegovina and Montenegro. These asylum applications are processed under a fast-track asylum procedure. Foreign nationals whose application was denied have to leave the Netherlands immediately. They will no longer receive any aid and fi nancial support for returning to their country of origin. This also applies to asylum seekers who withdraw their applications. Those who do not return to their country of origin voluntarily will be forced to return. Rejected migrants will be banned from entering the Schengen area (26 European countries) for two years. 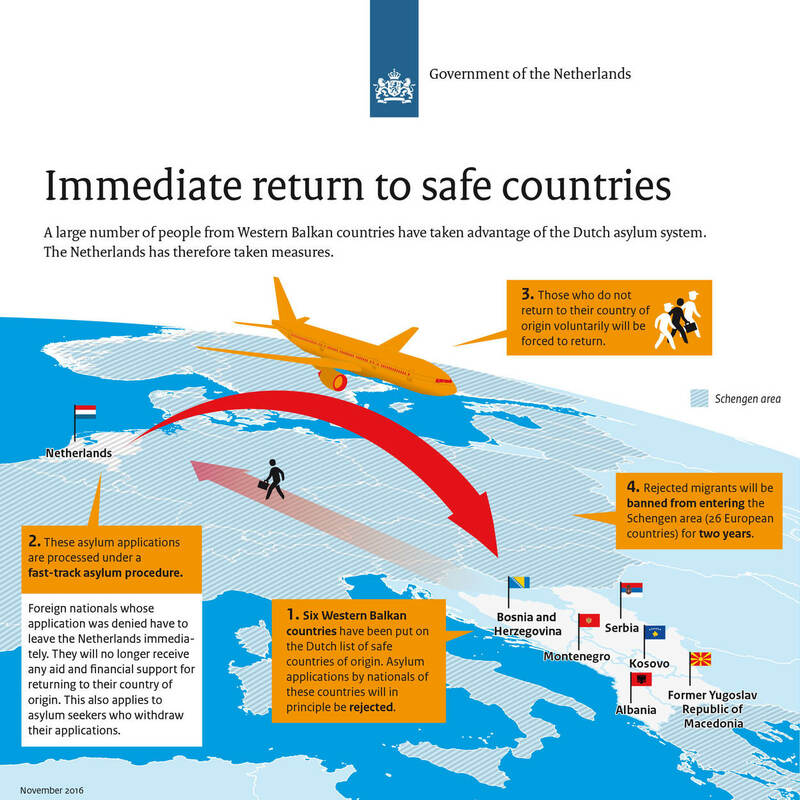 The Minister for Immigration has adapted the Dutch list of safe countries of origin. The Western Balkan countries were put on the list in November 2015. These are Albania, Bosnia and Herzegovina, Kosovo, Montenegro, North Macedonia and Serbia. Asylum applications made by people from the countries on the list can be dealt with faster and are normally denied. If an asylum seeker is from a country on the list of safe countries of origin, their application is dealt with more quickly, because the asylum seeker has very little chance of being granted a residence permit. A decision on their application will be taken within a week. The asylum seeker must demonstrate that they are in need of international protection. While their applications are being dealt with these asylum seekers remain at the central reception facility in Ter Apel. If an asylum application is denied because the individual is from a safe country, they must leave the Netherlands immediately. They are also banned from entering the EU again for the next 2 years. Following denial of their application, these asylum seekers are placed in restrictive accommodation to prepare for their departure. They can ask a court to review the decision to deny their application, but are not usually allowed to await the court’s decision in the Netherlands. They may however go to court to ask for a temporary order allowing them to stay. They can usually await the decision about the temporary order in the Netherlands. If an asylum seeker comes from one of the countries on the list of safe countries, they do not have access to extra services during their short stay in the Netherlands. This includes the subsistence allowance, courses and workshops. Extensive daytime activity programmes are not arranged for them either.